The last time we saw Kratos he was gazing over the aftermath of his battle with the Greek pantheon of gods. Having destroyed them all and plunged the world into utter chaos (which I could imagine was crazy inconvenient from everyone else’s perspective) there was a feeling of finality to his story. But did we honestly expect he’d just take up golf or fishing? Nope, he has made his way North and started his life over. Now with a new wife and son he has found himself thrust into the world of Norse mythology, which for me is like having a wish come true. Hopefully its not my only wish, because those genies can’t go advertising that you’ll get three and try and scam you out of the last two. There are lawyers on tv all day who would love to help me litigate. Armed with a crazy array of weapons and a super sick beard, Kratos is sure to literally raise hell no matter where he winds up in the world, which is exactly what I love about the original God of War games. And I love the crazy people you have to fight and the scenery that makes real life kinda boring and the scandalous side missions you hope to stumble upon when no one else is around so you don’t have to go and explain what’s going on. Look, I’m the last person to judge a guy who has the ashes of his dead loved ones permanently glued to his skin, cause dude deserves a break every once and awhile from that reality, but that doesn’t stop my wife from rushing in to the room and giving me a puzzled yet disapproving look. She is talented when it comes to combining facial expressions let me tell you. 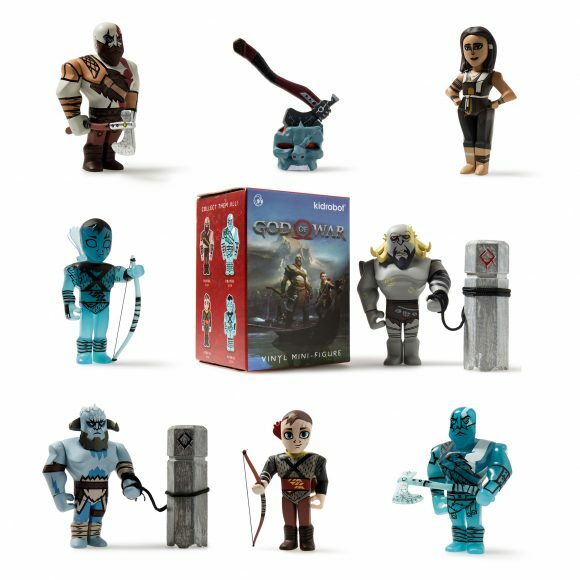 You can bring the epicness home in teeny tiny fashion with this God of War mini series from Kidrobot. There are heroes, there are villains, and there is Kratos who manages to be both at once. Will he find redemption in the unforgiving wilds of Scandinavia, or will he bring death and despair to everyone he holds dear? You’ll have to play the game to find out, but you can add this blind boxed series to your collection now by visiting www.kidrobot.com.